In the thirteenth minute, Brandon Stolz ’19 delivered a free kick to the head of Andrew Miller ’22, whose header fell to the feet of Eric Yu ’19. Eric rolled the ball into a corner and scored. With a score of 1-0 at the half, Abington switched to a more offensive posture. After a 3v3 attack by Abington in the 52nd minute, sweeper Chaitanya Jaikaria ’22 made a clean tackle at the edge of his defensive third. Clarence Kwong ’19 cleared the ball out of touch. Several players stepped forward to fill in when Chaitanya left the game with an injury. Aiden Jolibois ’21, newly called up from the junior varsity team, and Ryan Mitchell ’22 stepped up their game, and the revised defense coped well. 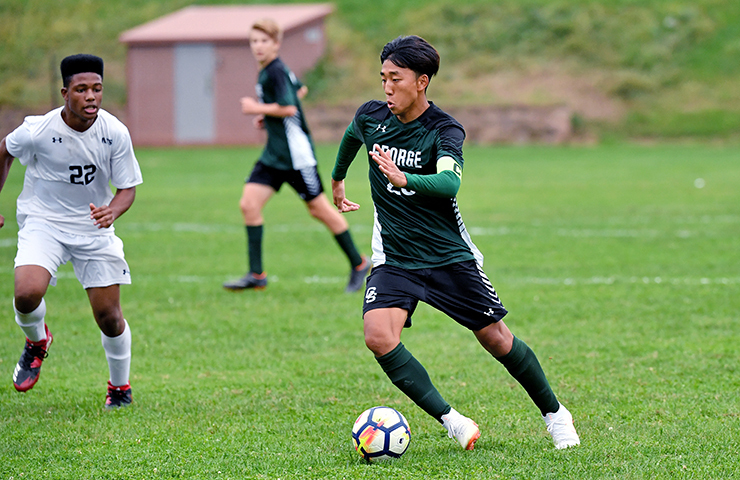 George School continued to attack, but could reap no reward until the 76th minute when Shumpei Chosa ’19 and Eric combined to win a ball in the left corner and Eric volleyed a hopeful ball into the mixer. “Andrew Miller ’22 made a speculative run and leaped to get a few hairs on the bouncing ball to lift it over the on-rushing Abington keeper for the second goal,” shared Paul Machemer ’65, head coach. The score was then George School 2-0. Abington never quits, and soon they attacked successfully down their left side and delivered a cross for an undefended teammate to tap in a goal at the right post, ending with a score of 2-1. Upcoming games include Germantown Friends School at home on Tuesday, October 9, away at Friends’ Central School on Wednesday, October 10, and Moorestown Friends School at home on Friday, October 12.